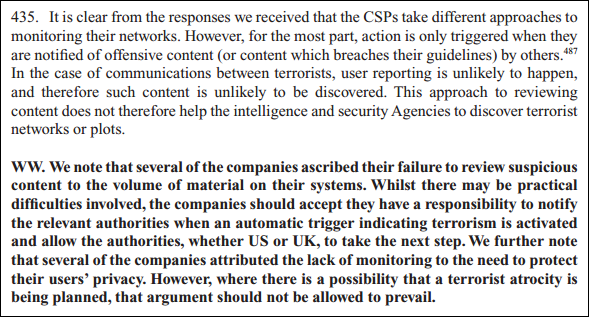 "We further note that several of the [US Communications Service Provider] companies attributed the lack of monitoring to the need to protect their users' privacy. However, where there is a possibility that a terrorist atrocity is being planned, that argument should not be allowed to prevail." 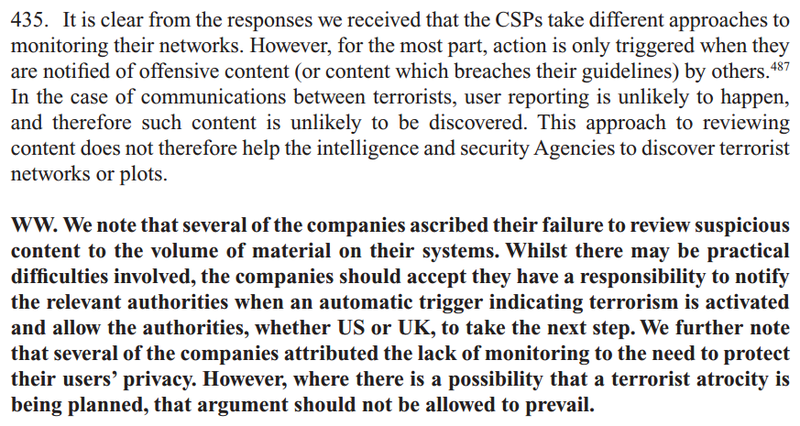 So… the possibility of terrorist communications negates the importance of privacy?? "Terrorist groups seek to cause widespread disruption, fear and intimidation. They use violence or the threat of violence as a means of publicising their causes, motivating those who might be sympathetic to them and intimidating those who do not sympathise. They often aim to influence government policies and they often reject existing democratic processes, or even democracy itself, as a means of achieving their objectives." From where I stand, the ISC has apparently been influenced to disregard privacy as a fundamental value.